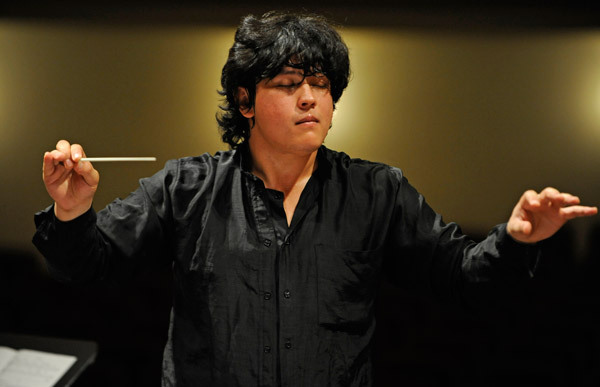 The remarkable young conductor Aziz Shokhakimov burst on the scene at the age of just 21 by astounding audiences in Bamberg, where he was awarded second prize at the Gustav Mahler International Conducting Competition under the auspices of the Bamberger Symphoniker. Recently Aziz Shokhakimov has made several triumphant debuts: In Germany with the Staatskapelle Dresden and Deutsche Kammerphilharmonie Bremen; in Italy with the Filarmonica del Teatro Comunale di Bologna and in Poland with the highly acclaimed Sinfonia Varsovia. Recognition came very early for Shokhakimov. Born in 1988 in Tashkent, Uzbekistan, Aziz entered Uspensky Music School for Gifted Children at the age of 6, where he studied violin, viola and orchestral conducting (professor V. Neymer). At the age of 13 he made his debut with the National Symphony Orchestra of Uzbekistan, conducting Beethoven’s 5th Symphony and the Lizst Piano Concerto #1. During the following year Aziz was invited to conduct his first opera, Carmen, at the National Opera and Ballet Theatre of Uzbekistan. In 2005, at the age of 17, he was invited to participate in a training program at the National Philharmonic Orchestra of Russia under the direction of Maestro Vladimir Spivakov, which resulted in an invitation to conduct the orchestra in a 2010 subscription concert. Soon after, Aziz received sponsorship from the Vladimir Spivakov International Charitable Foundation. In 2006, at just 18, Aziz Shokhakimov assumed the position of Principal Conductor at the National Symphony Orchestra of Uzbekistan, a position he continues to hold. In addition to his debut with Sinfonia Varsovia and his debut tour with I Musici de Montréal, his recent performances with the Bologna Teatro Communale Filarmonica, La Verdi Orchestra in Milan and the Russian National Philharmonic have resulted in immediate return invitations – La Verdi Orchestra, August 2012, for a special performance of the Shostakovich 7th Symphony. During the 2012-2013 season Aziz Shokhakimov will make his U.S. debut with the Oregon Symphony Orchestra, and he will perform with the Spanish Radio and Television Symphony Orchestra in Madrid (RTVE), Düsseldorfer Symphoniker and the Pacific Symphony.